Turnpike Troubadours, Cody Johnson and Parmalee are first to hit the Bud Light Stage! 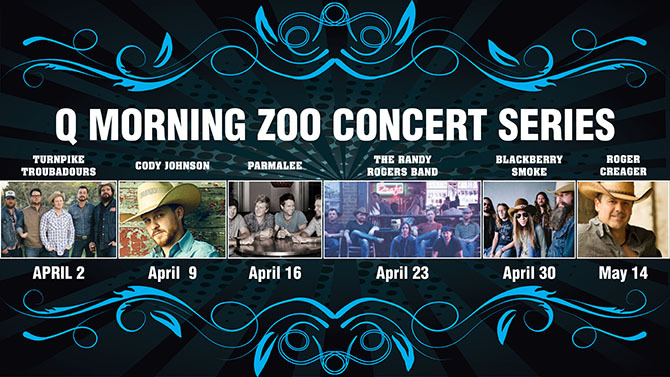 HOUSTON (February 15, 2016)—Sam Houston Race Park (www.shrp.com) is pleased to announce the Q Morning Zoo Concert Series on the Bud Light stage, will take place most Saturdays beginning on April 2nd through May 14th. These live performances will be free with $7 live racing admission before 8pm, $14 online before the day of the show for after 8pm arrival, and $20 at the gate after 8pm. The performances will follow the last of 10 Quarter Horse races each evening. “We are really excited about this year’s lineup. We are focused on providing Houstonians with great value and a fun night out with friends and family and are really pleased we can continue to offer these great artists for free with live racing admission before 8pm,” said Sam Houston Race Park President Andrea Young. Tickets will be available online Saturday, February 20th at 10 a.m. at www.shrp.com, at participating Houston-area Randall’s locations, or by calling 800-211-3381.